The Ebro Delta has an area of 32,000 hectares and is the second most important wetland in the lberian peninsular. It has been included in category A (of exceptional interest) by the International Union for the Conservation of Nature. It is located 178 kilometres to the south-west of Barcelona, an approximate two-hour drive by motorway. It is triangular in form with two large branching lobes to the north and south. The delta is the most important agricultural region of Catalunya, with rice being the main crop (50%), being cultivated between April and October. Salt mining is also an important part of the economy. Small farms elevated above the level of the water are a feature of the landscape and form part of a latifundia farming tradition, growing fruit and vegetables (25%). The delta has a variety of different ecosystems, including sand dunes, salt marsh and rice fields. Flocks of flamingoes are one of the Park's main attractions. It is estimated that more than half of the delta will be lost within the next 50 years. Approximately 47% lies only 50 centimetres above sea level with several cultivated areas lying below the level of the sea. Damming of the upper reaches of the Ebro has caused sediment loss and erosion of the delta (of up to 15 metres a year) is now a serious problem. The level of the sea is estimated to be rising at approximately 1.5 millimetres per year and the delta is currently sinking due to the weight of sediment by between 1 and 8 millimetres a year. 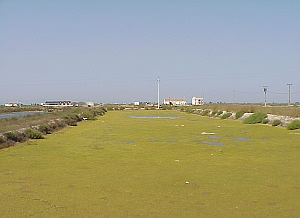 Eutrophication of lagoons caused by the use of fertilizers and pesticides is also a serious problems as is human trampling during the summer season. The area was threatened by the National Hydrological Plan (NHP) which envisaged the building of 120 new dams on the river as well as huge water transfers to Barcelona and the south-east of Spain. 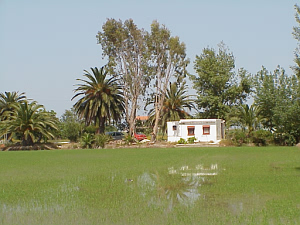 Mediterranean wetland management and issues, including threats caused by increased urbanisation, tourist developments, fish farming, river management and the National Hydrological Plan. The Visitors' Centre can provide an audio-visual presentation upon arrival. A boat excursion to the mouth of the delta forms one of the highlights of the day.